Brain scans from a 38-year-old, left, and a 73-year-old. 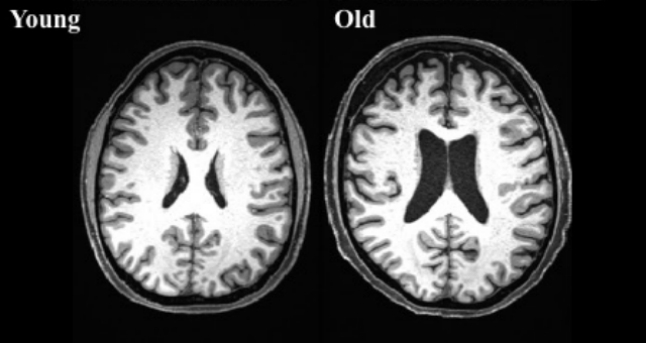 Look closely at the brain scans above, and one of the first things you notice is how the ventricles – the dark, butterfly shapes in the middle of the brain -- are much larger in the image labeled “old” than in the image labeled “young.” (The scans are from a 38-year-old and a 73-year-old.) You can see more darkness between the folds of the older brain and in the spaces between the brain and the skull. The darker areas are where cerebral spinal fluid is filling the empty spaces created by a shrinking, aging brain. We all lose brain tissue as we age, and scientists have been trying to discover how much this tissue loss effects our ability to think and remember. Bookheimer and colleagues at UCLA and three other sites in the U.S. hope to help scientists answer these questions about the brain’s connections by creating a massive, public database of brain information. Over the next two years, each site will scan the brains of 300 healthy people ranging in age from 35 to over 100, collect cognitive data and measurements such as blood pressure, hormone levels and body mass index. Two years later, they’ll re-scan everyone, allowing them to document changes. The project, launched this spring, is called the Lifespan Human Connectome Project Aging (HCP-A) Study and is sponsored by the National Institutes of Health. It’s an extension of the Human Connectome Project involving more than 1,100 healthy young adults ages 22-35. “Connectome” refers to the mapping of connections, or wiring, between brain regions. “You know those maps you’ll get from an airline, showing where the hubs are and the flights between the hubs? The brain is kind of like that, too,” says Bookheimer, principal investigator for the UCLA arm of the study. The images collected will include ordinary MRIs that depict brain structure; MRI-based “diffusion imaging,” which shows, in colorful detail, the brain’s white matter tracts; and functional MRI, which measures brain activity by detecting changes associated with blood flow. To decide which biological samples and testing data to collect, Bookheimer had many discussions with colleagues at Washington University in St. Louis, the University of Minnesota and Massachusetts General Hospital. They evaluated which measures were the most sensitive, reliable and valuable. Bookheimer advocated for putting menopause under the microscope. Many women report memory problems associated with menopause, and post-menopausal women are at greater risk of getting Alzheimer’s disease, suggesting a possible association between estrogen and Alzheimer’s disease. For information about volunteering, visit the HCP Aging study’s recruitment page.